Register now for the new edition of the TOY Online Course starting on 4th March! 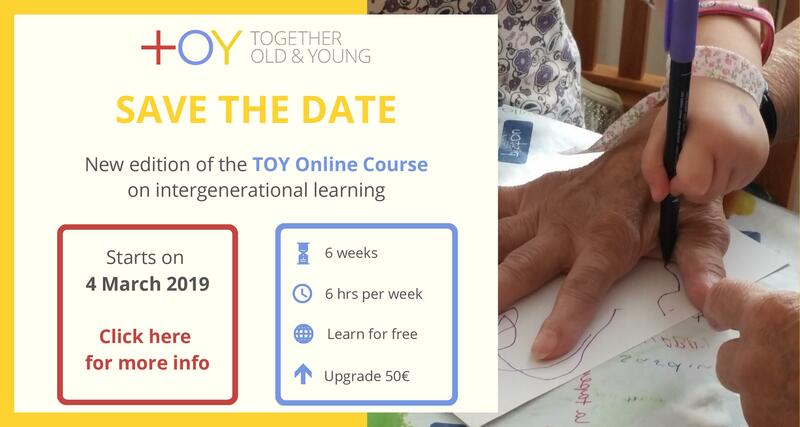 We are happy to open the registrations for the new edition of the TOY Online Course. After the very successful first edition of the course at the end of 2018, which saw the participation of hundreds of learners from all around the world, the new course will start on 4 March 2019. Through this online course you will learn about intergenerational practice with young children (0 – 8 years old) and older adults (65+ years old) and you will discover practical ways to create opportunities for good quality and sustainable intergenerational learning activities. The online course is free and is offered in English. It consists of four weekly Modules containing videos, articles, self-assessment activities, discussion forums, quizzes and games. Each Module requires approximately 6 hours study. On successful completion of the course you can upgrade your account at a cost of 50 Euro to receive the TOY Certificate of Achievement and have unlimited access to the course contents beyond the 6-week open period.